The siding on an airplane hanger in Lake Elmo. A football facility shed at Roosevelt High School. What do these three building projects have in common? All three served as real-life, outdoor classrooms that allowed high school students who participated in the Minnesota Trade Academy Summer 2018 program to learn about careers in construction. 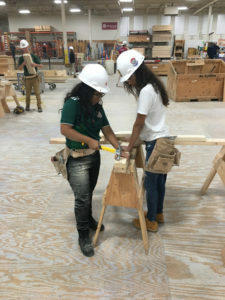 The Minnesota Trade Academy is one of the programs offered through Construction Career Pathways, a statewide nonprofit effort supported by trade unions, construction companies, a growing list of Minnesota school districts, and the State of Minnesota (DEED) that have all come together with the mission of introducing Minnesota’s young people to skilled careers in Minnesota’s construction industry. Because of limited funding, students must apply for a spot to participate for a limited number of spots available in the program. Students interested in participating in the program assemble references and are interviewed, and those who meet the program’s requirements are offered a spot in the program. This past summer, 98 students received offers to participate in the program. The annual summer program offers two tracks: Track 1 students receive an introduction to the wide array of trade jobs available to them, while the more advanced Track 2 session prepares students to select a specific career path and helps them gain the knowledge necessary to enter the workforce, such as applying for an apprenticeship offered by one of the participating trade unions. For example, if a student thinks that they would like to be a pipefitter, they could apply for a five-year paid apprenticeship program offered by one of the local pipefitter unions. For an idea of what students do during the Minnesota Trades Academy, check out this video compiled by the Saint Paul Public Schools. 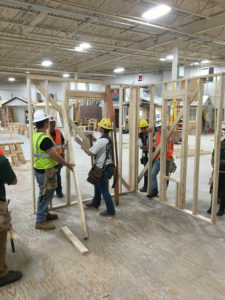 Through the generosity of local trade unions, which make their apprenticeship training facilities available to the Minnesota Trades Academy, high school students are left with no doubt about their choices in pursuing a career in the trades. The program offers the chance to expand the horizons of young people who are often pressured to pursue four-year college programs or enter the military. According to Sam Ebute, director of the Minnesota Trades Academy, the problem with the “college only” mindset is that many of students, as well as their parents, think that they must go to college to be a success in life. With the Minnesota Trades Academy program, Ebute wants to show middle school and high school students that there is another path to consider outside of college or the military. By building something and being paid for it, the program participants have a clear idea of what their work is worth. Ebute says the Minnesota Trades Academy shows the value earning while you’re learning. In addition, notes Ebute, skilled construction jobs are jobs that Minnesota’s construction industry desperately needs. According to Minnesota Department for Employment and Economic Development, over the next six years, Minnesota’s construction industry will need to add 25,000 jobs across various fields to keep up with demand for commercial, industrial and residential construction projects throughout the state. These construction jobs pay, on average, $27 per hour and offer numerous benefits, including health insurance coverage and a pension for union members. It’s opportunities such as these that have students from all backgrounds getting started in the Minnesota Trades Academy. Take Blake, a student from White Bear Lake, who shared during his interview process with Ebute that while his relatives are all white-collar professionals, he is excited about being the first blue collar worker in his family. 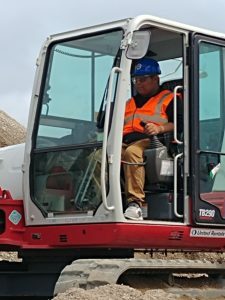 Part of the program’s goal is also to add diversity to the construction fields, a facet that benefits both workers and the communities. During the summer 2018 program, female students accounted for 20 percent of those participants and 76 percent came from underrepresented communities. 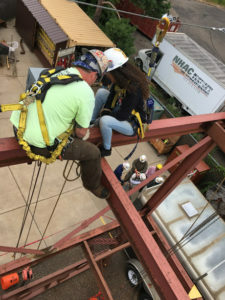 (Check out the experience of Ahleah and Halle, two Saint Paul students who participated in the Minnesota Trades Academy this past summer). Public and private partnership has been a key to accomplishing this goal. With programs such as Minneapolis’ StepUp, St. Paul’s Right Track and White Bear Lake’s U Lead initiatives helping the Minnesota Trades Academy with administration and recruitment, the program has flourished as young people from those cities and neighborhoods have discovered the program. 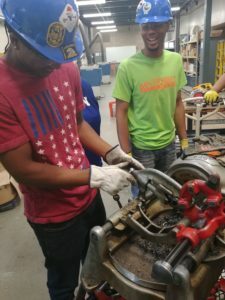 With 66 graduates from the program this past summer, young adults are responding to the chance to “earn as they learn.” Minnesota Trades Academy doesn’t end after graduation however, as the program eventually circles back to offer skilled trades professionals the opportunity to teach young people as part of the program. 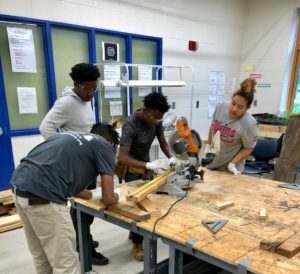 “It’s magical to watch skilled workers, such as Amanda, a pipefitter who is in the fourth year of a five year pipefitting apprenticeship program, give back to the high school students by sharing what she has learned,” Ebute says. It has been a long process to develop the program into what it is today, but with the tremendous partnerships between the Minnesota Trades Academy, trade unions and public schools, Minnesota Trades Academy is changing the culture around trade jobs. Ebute points to a subtle, but important shift in the status quo. The Minneapolis Public Schools until recently had a mission statement that focused only on preparing students to be “college ready.” Now, that statement reads: “Every child, college and career ready”, an important acknowledgment of the amazing options available through the Minnesota Trade Academy.